I heard this yesterday in a radio talk by Father Greg Boyle: "The woman was crying because she recognised you as the shape of God's heart." He runs a business in L.A. that hires ex-gang members. The 'you' in that quote was a man who, an ex-gang member, now works in the office hosting tours of the facility in Los Angeles, and who was just returning from a dinner at the White House. I sometimes feel like an ex-gang member myself. Different gang. We, the priveleged, slay with different weapons. Long story. I watched a boy play in the tidal mud and sunshine, looking, probably, for crabs in the shape of God's heart, and wondered what that felt like. I worshipped the yearning in that woman's son in L.A. that made him charm the visitors, and I worshipped the yearning for krill in that little boy on the beach, and I wondered. 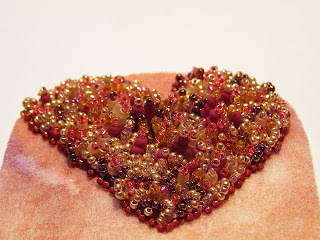 I worked on the heart of Heartroot yesterday. and here the heart. 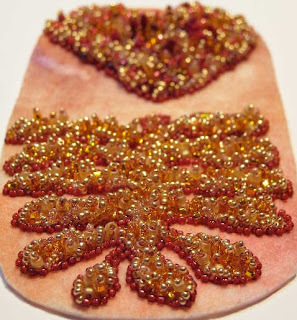 I used golden iris beads, and pink translucent, and deep red, and gold, and gold translucent ... 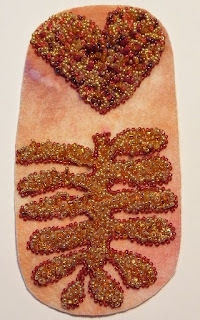 I sew the beads in, deep and full, wishing that I could recognise the shape of God's heart at my fingertips.